Is it stealing if it’s from a ‘Little Free Library’? Everything about Austin’s Little Free Libraries is charming. A lot of the “libraries” are shaped like glass-doored birdhouses and one of the only two requirements is that they’re little (read: adorable). The other, of course, is that they’re free. Understandably, Austin’s volunteer librarians are upset. The Little Free Library organization encourages its participants to “build a literacy-friendly neighborhood” and always falls back on the “take a book, return a book” golden rule. Homeowner Jenny Hodgkins told KUT she was both disturbed that all the books had been taken and by the fact that whoever took them didn’t bother to shut the library’s door behind them. 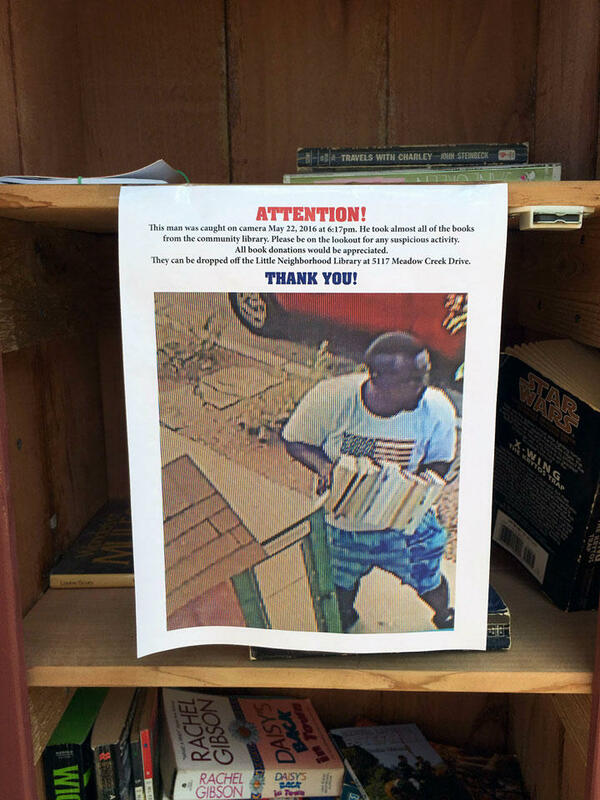 Residents responded by stamping books to help local bookstores identify and pass on purchasing them, and (thanks to someone’s non-stop camera) printing flyers featuring a fairly good shot of the culprit mid-pilfer. We’re sure there’s an intro-to-economics-fallacy in here somewhere, but maybe it’s a little simpler than even that: If it’s “free”, it’s not stealing. Right?